Hi there, crafters! 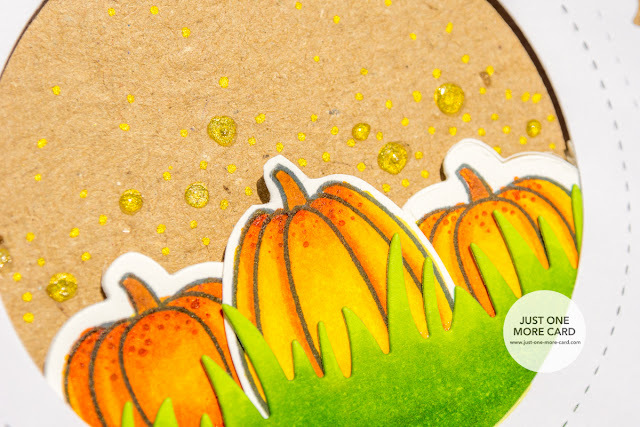 Today I'm back with one of the stamp and die set combos which has quickly turned into one of my all time favorites this fall season! 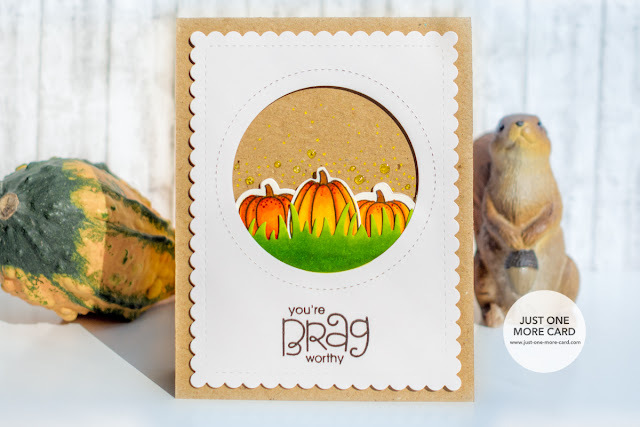 At first glance, the "Witch Way is the Candy" set by My Favorite Things is all about Halloween, but you can totally use it for Thanksgiving and fall-themed cards as well! I kept the card very simple – just a die cut window for which I choose a circle, but you can do a scalloped circle, a square or whatever else strikes your fancy. I wanted the focus to be on the gorgeous pumpkins and the contrasting green grass. Of course you could turn this card easily into a shaker card, or add more pumpkins to make it an entire field of orange deliciousness (pumpkin soup, anyone?? ), or even use the pumpkins themselves as shaker elements! There really is no limit to what you can do with them. I simply added a few gold dots with a glossy finish to add a little bit of interest. To finish up the card, I grabbed one of my all time favorite sentiment sets by Paper Smooches. It's so incredibly versatile and fits almost any occasion, so that's a great one to have handy at any time. Thanks for stopping by today – I hope you enjoyed the project and have a great day!